The NRA goes silent. Is this good strategy? That quiet sound you hear is the NRA not saying anything … which makes an interesting case study. Regardless of your politics or emotions about the tragedy in Newtown, Conn. (which happened just miles from our office), if you work in communications you know shocking events can create uncontrollable tides of response. One organization dealt a blow by the Connecticut shooting of little schoolchildren is the National Rifle Association, a force for defending gun rights that is now the pinata of public debate on gun control. 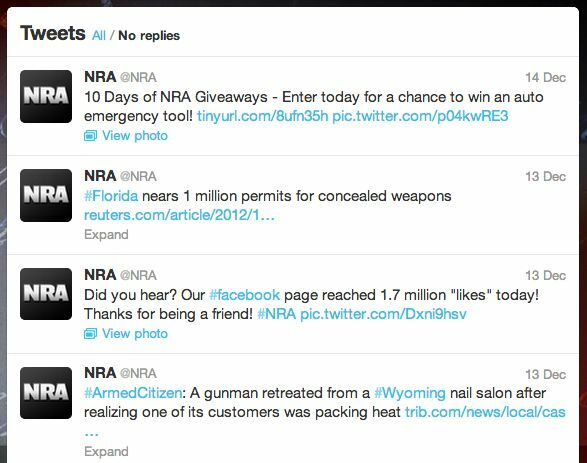 Caitlin Dewey of The Washington Post noticed that after the shooting, the NRA immediately shushed its numerous social media accounts. A visit to its Twitter node shows the last update was Friday morning. This is not the first time the NRA has gone dark following a gun tragedy. After Gabrielle Giffords was shot in January 2011, the association removed itself from public communications for days. Nor is the NRA alone in the silent treatment; when Carnival Cruise Corp. had a ship run aground in January, it plugged all social media streams (although, perhaps not expecting such a crisis, Carnival took several days before turning off everything; somehow we suspect the NRA has crisis plans in place). Does shutting down work? Some say no. PR strategist James Lukaszewski wrote in the 1990s that non-action in crisis communications can lead to embarrassment or prolonged visibility. However, if you can’t change your position and admit wrongdoing — the classic PR response is to say, “yes, it’s our fault, and we are going to work to fix it!” — then silence may be the last option. You can’t apologize if your position can’t be moved, and the NRA is locked into advocacy for weapons. Maybe it’s right. Eventually the public will move on. Given the stakes for the NRA, its best position may be to wait and see. Little bit of a disconnect as the NRA itself didn’t commit any crime here. They bring nothing to the conversation at this point in the grieving process. In my opinion, the silence is the best strategy they can have. And they probably should have it until the national debate on gun control commences with more of a tone of civility than it has now. Good food for thought though.